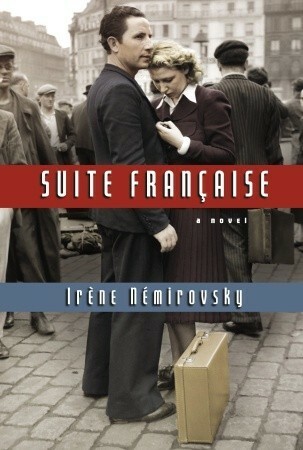 Suite Française by Irene Nemirovsky is brilliant. I bought the book in 2007 when everyone was reading it, but I didn’t get around to it. I knew the subject matter, and maybe I thought it was too dark. But recently my Reading Liberally group chose it to read, so I opened it up and dived in. Wow. As you probably already know, Nemirovsky was respected novelist, a Russian emigre in France, when she was arrested in 1942 and died later that year in a concentration camp. Her husband was also arrested and killed, but her two daughters, protected by their governess and various family friends, managed to survive. And so did the manuscript of this book. The book consists of two sections out of a planned five-part book that would have mirrored the structure of a symphony. The first section, “Storm in June,” details the great exodus from Paris in 1940 as the Germans approach. The narrative follows several different Parisian residents as they flee, their paths sometimes intersecting. I found this account enthralling. The second section, “Dolce,” is the story of the interaction between the residents of a village some distance from Paris and the German soldiers who make up the occupying force. Again, this is fascinating. The book also includes the author’s notes, giving some idea of where the remainder of the novel was headed. What a terrible loss that it was never completed.